Pembroke family of Wilton. Wilton Church. 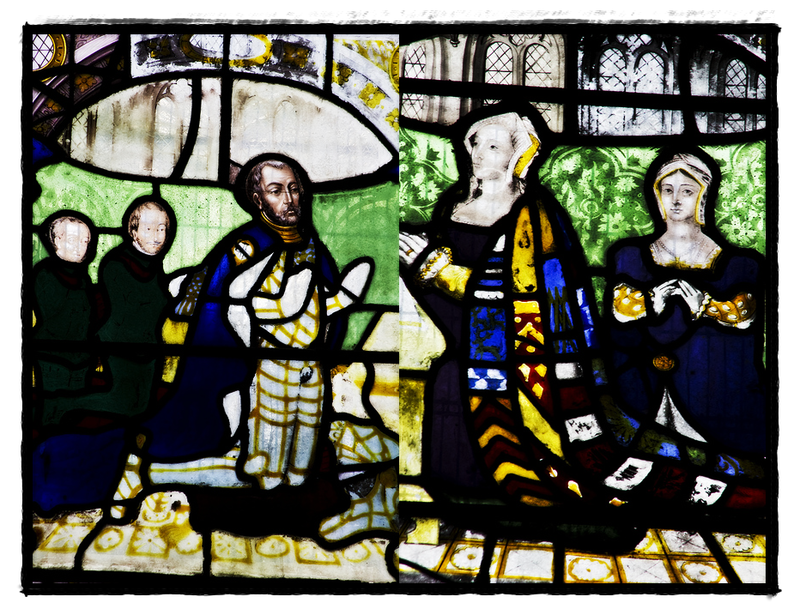 Left panel shows the 1st Earl of Pembroke with his two sons, Henry (future 2nd Earl of Pembroke) and Sir Edward of Powis. Sir Edward Herbert of Powis Castle (Jun 1544-23 March 1595) was the second child and son of Sir William Herbert, 1st Earl of Pembroke (10th creation) and his first wife, Lady Anne (Parr). His siblings were Lord Henry Herbert (later 2nd Earl of Pembroke) and Lady Anne Talbot, wife of Lord Francis Talbot. Through his mother, Herbert was a nephew to Queen Katherine Parr and the 1st Marquess of Northampton, William Parr. Upon the death of his aunt, Queen Katherine, his mother became the sole heiress to her brother the Marquess of Northampton. Herbert was a member of the Herbert family, a Welsh noble family who descended from Sir William ap Thomas of Raglan Castle. His father, Sir William Herbert, 1st Earl of Pembroke of the second creation (within the Herbert family) was the grandson of the first creation also named William (1423-1469). From birth, Edward Herbert had the backing of his family’s powerful clan. It also didn’t hurt that his father, the Earl of Pembroke, would become a large influence at court. Due to his mother’s affiliation to Henry VIII’s last queen, Katherine Parr, Herbert’s father owed some of his advancement to Edward’s mother — Anne. Lady Pembroke (at the time Lady Anne Herbert) was sister to Queen Katherine, the last queen consort to King Henry VIII. In the reign of Henry VIII’s children, especially Edward VI, Pembroke became a guardian to the young king and was part of the court circle of men around the boy. Pembroke tried to advance his standing by marrying his son to a granddaughter of Princess Mary Tudor (Henry VIII’s younger sister and designated heirs to the throne after his immediate children), Lady Katherine Grey. The marriage was to bring the family close to the crown upon the attempt to put Grey’s sister, Lady Jane, on the throne as Queen. When Lady Jane was “deposed,” Pembroke tried to distant himself from the “traitors” which included his brother-in-law, Northampton. Pembroke had the marriage between his son and Lady Katherine annulled and tried to gain favour with the Catholic queen Mary Tudor. The plan worked and his family was spared. Pembroke would also contribute heavily to the reign of Elizabeth I.
Lord Pembroke’s marriage to the queen’s sister advanced the family and Anne gave legitimacy to the Herbert family. Lady Pembroke’s descendants also had the luxury of becoming the heirs of the Parr inheritance once Lady Pembroke’s brother, William, 1st Marquess of Northampton died in 1571 without issue. Although the title of Marquess of Northampton and Earl of Essex were forfeit, the children inherited other “titles”, manors, lands, etc. HANWORTH, a village and a parish in Staines district, Middlesex. Ordnance Survey First Series, Sheet 8. In June 1544, the Queen lent her sister Lady Herbert her manor, Hanworth for the lying-in for her second child. It was there that Anne Herbert gave birth to her second son, Edward (his elder brother was named Henry, was this a coincidence?). 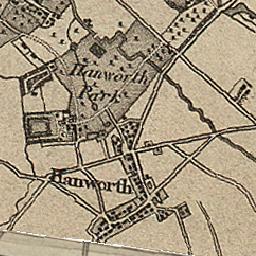 The Queen sent regular messengers to Hanworth to inquire on the health of her sister. For the christening, the queen provided a large delegation (five yeo-men, two grooms, and Henry Webbe) from her household to attend. Letters continued well into July between the two sisters while Lady Herbert remained at Hanworth. After the birth, Lady Herbert visited Lady Hertford (Anne Stanhope), who had also just given birth, at Syon House near Richmond. In August 1544, the queen paid for a barge to bring her sister Lady Herbert by river from Syon House (home to the Hertford’s) to Westminster. The queen’s involvement in the birth and christening of her nephew would eventually lead her to take him in as part of her household after the death of King Henry. After King Henry VIII’s death in January 1547, when the queen dowager’s household was at Chelsea, both Lady Herbert and her son Edward were part of the household there. The Dowager queen, as always, was keen to have her family close to her. After having no children of her own by her previous three husbands and no role in the new government, the queen probably didn’t mind having her toddler nephew around. While Lady Herbert attended her sister, her husband Lord Herbert was appointed as one of the guardians to the new king, Edward VI. Lord Herbert became part of the circle around the new king which included his brother-in-law, the Marquess of Northampton. 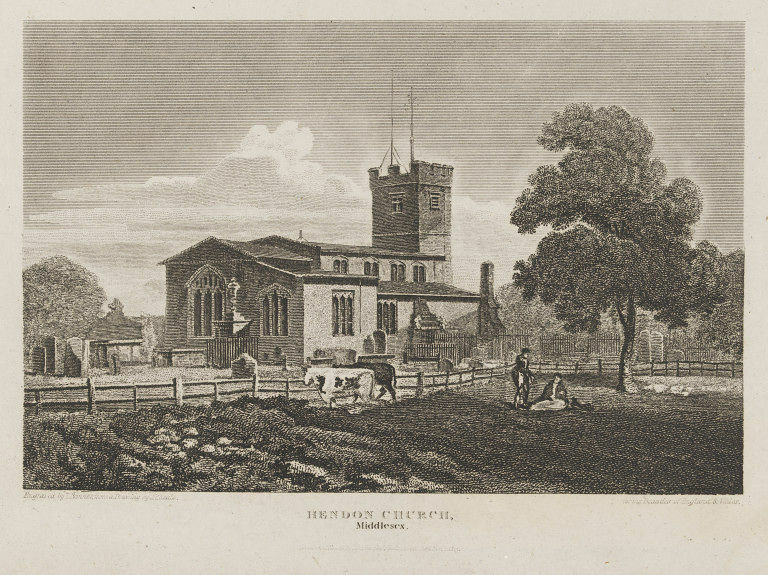 Hendon Church, Middlesex. London, England; June 1, 1815 (published). John Preston Neale, born 1766 – died 1847 (artist); Bonner, Thomas, born 1735 – died 1816 (engraver) Engraving. Given by Dr. G. B. Gardner. 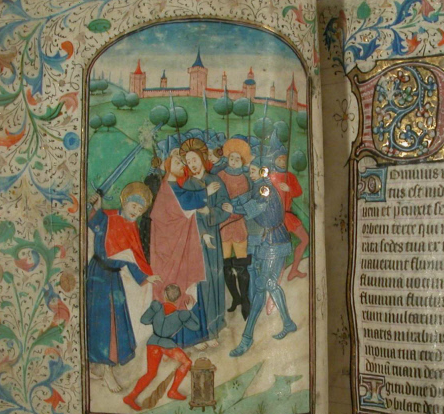 V&A Online Collections. At the age of his majority, Herbert returned for the family borough and never sat for Parliament again. On the death of his father in 1569, Herbert inherited the manor of Hendon, Middlesex. He also inherited his mother’s lands in Northampton and Westmorland (the Parr inheritance). 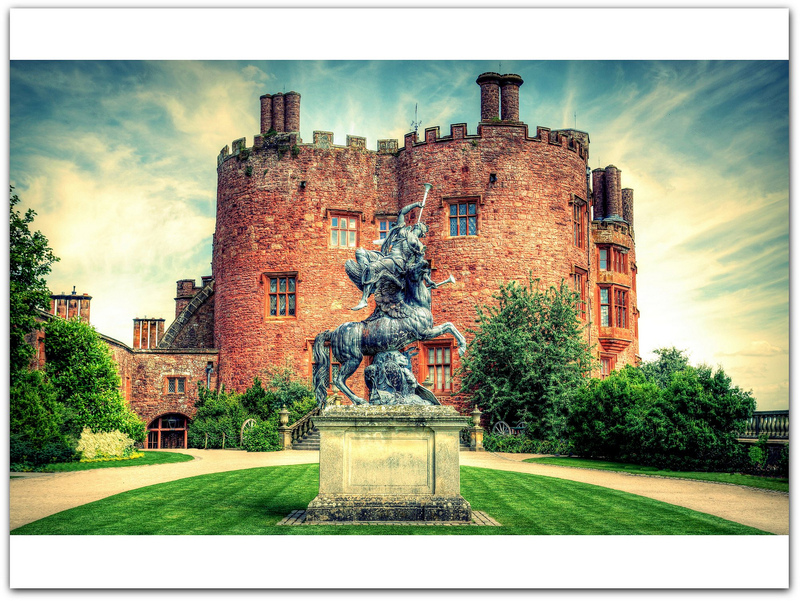 Probably the most important event in his life was the purchase of Powis Castle in Wales (at the time it was called “Poole Castell”). Sir Edward Herbert bought the lordship and castle in 1587 from Edward Grey, a feudal Lord of Powis. Edward Grey was the illegitimate child of the last Lord Powis and Jane Orwell; therefore his father’s estates, which he inherited, came with limitations within Lord Powis’s will. One of those limitations was the obvious title, Baron Powis, which would be bestowed on Herbert’s son, William Herbert, in the reign of James I. The castle Sir Edward took over was probably in serious need of repair and modernisation, and he undertook extensive work between 1587 and 1595, of which only the long gallery survives (completed in 1593). Herbert’s interests were mostly in Montgomeryshire and he had little to do with public life (most likely by choice). He was knighted in 1574. In 1590, his brother the 2nd Earl of Pembroke put him forward for a membership in the council of the marches. Herbert appears to have been of the Catholic faith and that may also explain his non-involvement in Parliament and at the court of Elizabeth I. Herbert’s wife however was Catholic and it was most likely to her influence that he converted. Lord and Lady Herbert’s names appeared on a list of Catholics drawn up between 1574 and 1577; his wife’s name would appear again in 1582. In 1580, Henry Sydney (brother to his sister-in-law Lady Pembroke), was to arrest recusants and did institute proceedings against them in Montgomeryshire. The Herbert’s were left to be until June 1594 when Lady Herbert and her five children, all under age, were presented for recusancy, not having attended Church services (Protestant) at the parish church in Welshpool for twelve months. Women were very important to the recusant cause in Wales, as in England. Often a wife stayed at home while her husband kept up appearances by attending Anglican services. Some people outwardly conformed to avoid stiff fines, but secretly remained Catholics. In 1581, it was made treason to convert to Catholicism, or try to convert someone else to it; further measures followed, and the penalty for being caught was often death. But some Catholics risked their lives all the same. The Jesuit order provided many missionary priests, some raised in Wales but trained on the continent. It was a perilous life, and some Welsh homes still have priest holes, where these men hid from the authorities. A number of Welsh Catholics (mostly priests) were executed in the 16th and 17th centuries. In 1570, Herbert married Mary Stanley, daughter and heir of Sir Thomas Stanley of Standon, Herts. and London. They had four sons and eight daughters. Their children included the eldest son and heir Sir William Herbert, 1st Baron Powis; George, who died unmarried; Sir John Herbert, Knt, who died without issue; Edward, who died a bachelor; Elizabeth died young; Joyce; Frances; Jane; Mary; Winifred; and two more daughters named Anne and Katherine (most likely named after Herbert’s mother and aunt, the queen). Herbert died on 23 March 1595 and was buried in Welshpool Church, Montgomeryshire, where a monument is erected in his memory on the North side of the Chancel. The Herbert memorial consists of two figures in black marble kneeling. In the middle is an inscription in letters of gold, in roman capitols. Here lyeth the Bodyes of the Right Worshipful Sir Edward Herbert, Knight, second Son to the Right Honourable Sir William Herbert, Knt. Earl of Pembroke, Lord Cardiffe and Knight of the most Noble Order of the Garter, and of Anne his Wife, Sister and sole Heire to Sir William Parr, Kt. Lord Parr of Kirbeby, Kendall, Marmion, FitzHugh, St. Quintin, Earl of Essex, Marquis of Northampton, and Knt. of the most Noble Order of the Garter. Which Sir Edward Herbert married Mary Daughter and sole Heire to Thomas Stanley of Standen, in the County of Hertford, Esq; Master of the Mint, A.D. 1570, youngest Son of Thomas Stanley of Dalgarthe, in the County of Cumberland, Esq. Which Sir Edward Herbert and Dame Mary his Wife had Issue iv Sonnes and viii Daughters, viz. William Herbert, Esq; his eldest Sonne and Heire, who married Lady Eleanor, second Daughter to Henry late Earl of Northumberland, George Herbert, 2d Son, John Herbert, 3d Son, and Edward Herbert, 4th Son : Elizabeth, first Daughter died young, Anne 2d Daughter, Joyce 3d Daughter, Frances 4th Daughter, Katharine 5th Daughter, Jane 6, Mary 7, and Winifred 8th Daughter. Which Sir Edward died 23 Day of March DMDLXXXXIV and this Monument was made at the Charge of the sayd Lady Herbert 23 October 1595.
Letters of administration were issued to his widow in April 1595. Susan James. “Catherine Parr: Henry VIII’s Last Love,” The History Press, US Edition: 2009. pg 275-76. George Edward Cokayne. Complete Peerage of England, Scotland, Ireland, Great Britain and the United Kingdom, Extant, Extinct, Or Dormant , Volume 6. G. Bell & sons, 1895. pg 295. A letter dated 8 October 1590 from Sir Edward Herbert at “The Poole Castell.” Kynaston Peerage Papers No 148. Hugh Montgomery-Mass, Christopher Simon Sykes. “Great Houses of England & Wales,” Laurence King Publishing, 1994. pg 44-45. Google eBook. “The History of Parliament: the House of Commons” 1558-1603, ed. P.W. Hasler, 1981. HERBERT, Edward II (c.1542-95), of Wilton, Wilts. 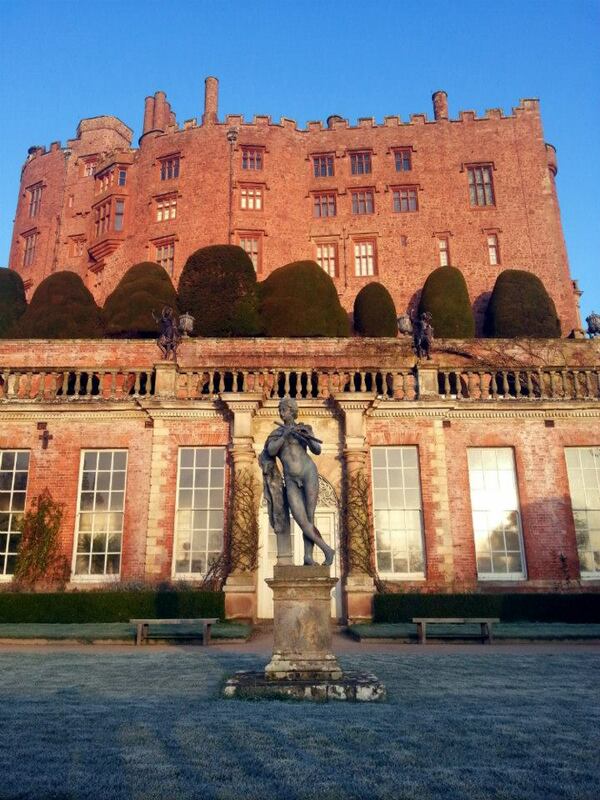 ; later of Powis Castle, Mont. Edward Thornton Evans. “The History and Topography of the Parish of Hendon, Middlesex,” Simpkin, 1890 – Hendon (London, England). pg 37. Arthur Collins. “The Peerage of England,” Volume 1, 1735. pg 506. Google eBook. Powis Castle, Welshpool, Powys, Wales, UK photo by Cluke. William Herbert, 1st Baron Powis of Powis Castle (c.1573 – 7 March 1655/6) was a Welsh nobleman and politician who sat in the House of Commons at various times between 1597 and 1629. Herbert was born in Powis Castle, the son of Sir Edward Herbert (June 1544–1593) and his wife Mary Stanley, daughter of Sir Thomas Stanley, Under-Treasurer of the Royal Mint. His paternal grandparents were William Herbert, 1st Earl of Pembroke and Lady Anne (Parr). He was a nephew of Henry Herbert, 2nd Earl of Pembroke and Lady Anne Herbert, Lady Talbot. By his grandmother, Lady Pembroke (Anne Parr), he was a great-nephew of Queen Katherine Parr. 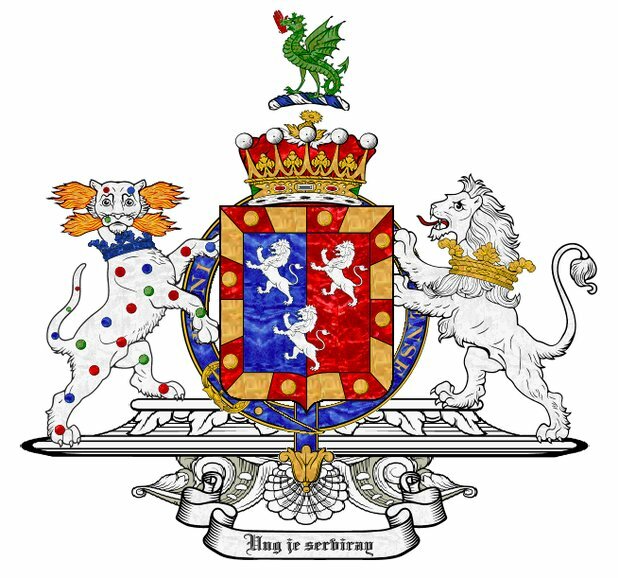 The arms of the Herbert Marquesses of Powis and Earls of Powis, First Creation (1674). Sir William Herbert, 1st Marquess and Earl of Powis was the grandson of the 1st Baron Powis. Herbert was a member of the Herbert family, a Welsh noble family who descended from Sir William ap Thomas of Raglan Castle. His grandfather, Sir William Herbert, 1st Earl of Pembroke of the second creation (within the Herbert family) was the grandson of the first creation also named William (1423-1469). From birth, William Herbert had the backing of his family’s powerful clan. It also didn’t hurt that his grandfather, the Earl of Pembroke had been a large influence at court during the last few years of Henry VIII and in the reign of his children Edward VI and Elizabeth I (the Protestant monarchs). His grandmother Anne Parr was sister to Queen Katherine. Lord Pembroke’s marriage to the queen’s sister advanced the family and Anne gave legitimacy to the Herbert family. Anne’s descendants also had the luxury of becoming the sole heir of the Parr inheritance once Anne’s brother, William, 1st Marquess of Northampton died in 1571 without issue. Herbert inherited Powis Castle (at the time it was called “Poole Castell”) from his father. Sir Edward Herbert bought the lordship and castle in 1587 from Edward Grey, a feudal Lord of Powis. Edward Grey was the illegitimate child of the last Lord Powis and Jane Orwell; therefore his father’s estates, which he inherited, came with limitations within Lord Powis’s will. 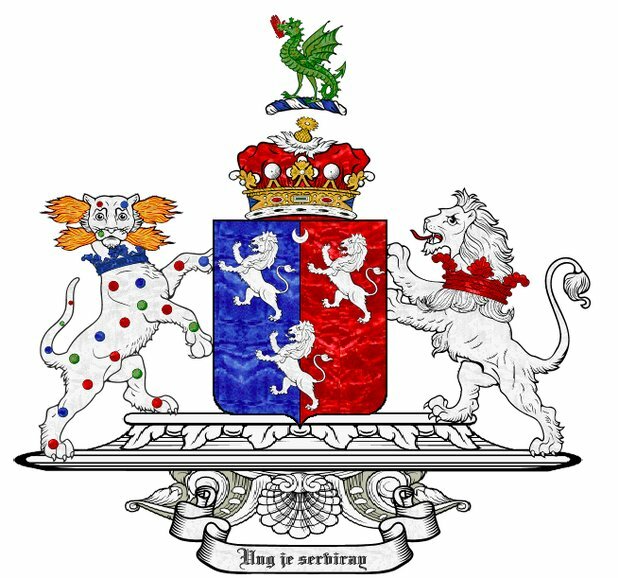 One of those limitations was the obvious title, Baron Powis, which would be bestowed on the Herbert’s in the reign of James I. Edward Grey’s father, Sir Edward Grey, 4th Baron Powis had married firstly to Lady Anne Brandon, daughter of the Duke of Suffolk and his second wife Anne Browne. The marriage however produced no children. Before 1600, Lord Powis married Lady Eleanor Percy, third daughter of Henry Percy, 8th Earl of Northumberland and his wife, Hon. Katherine Neville. Lady Northumberland was the daughter and co-heiress of John Neville, 4th Baron Latimer of Snape, the step-son of Queen Katherine Parr by her second marriage to his father, the 3rd Baron, also named John. Percy Herbert, later 2nd Baron Powis. Katherine Herbert, who married firstly to Sir Richard Vaughan of Lydiard and secondly to Sir James Palmer, Knt. By her second husband, she was the mother of Roger Palmer, 1st Earl of Castlemaine. Lord Castlemaine was married to Barbara Villiers; mistress to King Charles II of Great Britain who was created Duchess of Cleveland. Lucy Herbert, who married in early 1633 to William Habington (or Abington) of Hinlop. He was succeeded by his son Percy Herbert, 2nd Baron Powis. Lady Powis died on 24 October 1650 and was buried in the vault of Lady Latimer (her maternal grandmother Dorothy de Vere, the 1st wife of Sir John Neville, 3rd Baron Latimer of Snape, himself the 2nd husband of Katherine Parr) in Hackney, Middlesex, London. Lord Powis died five years later, abt 83 years of age, and was buried at St. Mary’s Church in Hendon, Middlesex, London. Sir Bernard Burke. A Genealogical History of the Dormant, Abeyant, Forfeited, and Extinct Peerages of the British Empire, Harrison, 1866. pg 275. There is confusion as to his death date. Burke states 1655. Cokayne and the History of Parliament states 1656. European Heraldry. House of Herbert. Morris Charles Jones. The Feudal Barons of Powis, 1868. Douglas Richardson. Magna Carta Ancestry: A Study in Colonial and Medieval Families, 2nd Edition, 2011. pg 300. The History of Parliament: the House of Commons 1558-1603, ed. P.W. Hasler, 1981. HERBERT, William III (c.1573-1656), of Powis Castle, Welshpool, Mont. and Hendon, Mdx. © Meg McGath, 20 January 2013.